Americans who respect the Constitution have been heartened by the oral arguments in the Supreme Court over the constitutionality of Obamacare. Based on the thrust of the questioning and comments by Chief Justice Roberts and Justices Kennedy, Scalia and Alito, there is good reason to hope that not only will the individual mandate be ruled unconstitutional, but that as a result the entire 2,700 page law will be thrown out. We will not know with certainty until the actual decision is released, which Court observers expect will be in June. Justice Kennedy has disappointed constitutionalists before, and is capable of cobbling together some narrow reason to let the individual mandate and the entire law survive. However, assuming the law is ruled invalid, what next? Historical comparisons are never exact, but those who have studied the rise of the modern federal regulatory state can feel a sense of déjà vu over the events of the last few days. In the mid-1930s, a series of headline-making Supreme Court decisions overturned not one but many aspects Franklin Roosevelt’s New Deal. Some observers thought the whole Roosevelt program dead, and expected a major Republican comeback in the 1936 elections. Instead, FDR went on the attack, blaming “economic royalists” for the continuation of the Depression and denouncing the Supreme Court for blocking Democrats’ efforts to use government to “help” Americans recover from the Depression. One can reasonably argue that the entire Democrat campaign was a massive prevarication, but politically it worked. FDR won re-election in a landslide, and Democrats made substantial gains in Congress. In the midst of this political attack, one of the Supreme Court justices who had been voting against the New Deal laws, Owen Roberts (no relation to the current Chief Justice), switched to uphold a New Deal law like one the Court had struck down only a year before. Shortly thereafter Roosevelt launched his infamous “court-packing” scheme, so Roberts’ vote has since become known as the “switch in time that saved nine.” However, more important than this, other justices who had been voting against the New Deal laws began to retire. Although he had not been able to appoint a single justice in his first term, by the end of his presidency FDR had named eight of the nine justices. Starting from 1937, the increasingly Democrat Supreme Court reversed most of the anti-New Deal decisions, and effectively eliminated all constitutional restraints on federal economic regulation. This culminated in the 1942 Wickard v Filburn decision which held that if an economic activity might affect interstate commerce the federal government can regulate it. Wickard is the foundation on which not only Obamacare, but almost every other modern federal economic regulatory scheme is based. It is the basis for allowing the EPA to regulate the use of tiny parcels of land and to stop any economic activity which might affect a single obscure species found in only one state. It is the basis for preventing a local farmer who only sells locally from calling his produce “organic” unless she or he complies with reams of federal paperwork. The examples go on ad nauseam. At the end of his presidency, FDR boasted that, although he had lost the battle over his court-packing plan, he had won the war of bringing the Supreme Court into line with his New Deal philosophy of vastly expanded federal power. What lessons do the events of the 1930s have for us today? First, it is still critical that Obama be defeated. It is almost certain that any decision against Obamacare will be 5-4. Justice Scalia is 76 years old and Justice Kennedy is 75. While Justice Thomas is “only” 63, he is said to be frustrated with his lonely stance of firmly standing by the Constitution’s original meaning (even Scalia can drift from respect for the Constitution’s original meaning). All Obama has to do is to replace any one of these three in a second term, and the Supreme Court will shift to upholding the leftist agenda by consistent 5-4 votes, including reversing any decision against Obamacare by the current Court. Second, a Supreme Court decision against Obamacare could dilute the energy for reducing federal power back to something approaching its original constitutional bounds. The legal arguments presented against Obamacare assume the validity of all prior Supreme Court decisions. A decision overturning Obamacare will draw a line against the further expansion of federal power, which is a very good thing, but it will do nothing to roll back the previous expansion of federal power since the New Deal. The EPA and all of the other alphabet soup of czars and regulatory agencies will remain undisturbed. Again, complacency and lack of a clear target are the dangers. Third, a victory in the Supreme Court will perpetuate the myth that the Supreme Court will protect our freedoms. As the FDR New Deal cases like Wickard and many since show, the Supreme Court is just as capable of taking away our freedoms as it is of preserving them. We need to get over the New Deal idea that the Supreme Court is the ultimate arbiter of the meaning of the Constitution, and has the right to change its meaning to keep it up-to-date with current social thought. We can not rely on the Supreme Court. 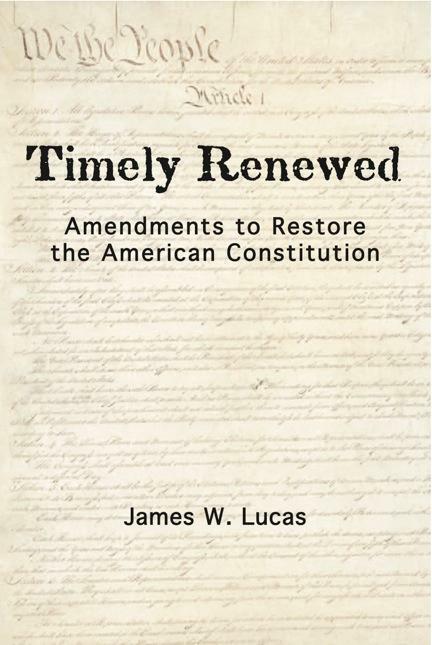 Only the political victory of Americans who respect the Constitution, reinforced by constitutional amendments restating and re-affirming the Constitution’s original meaning and structure, can permanently assure the restoration of our freedoms and Republic. To accomplish the first we need to elect constitutionalists to Congress and state and local offices, not just the presidency. To accomplish the second, we need to reform the amendment process to allow states to initiate and enact amendments without having to go through Congress or the unused and archaic mechanism of a convention. Such a proposal can be found here.